The Latest Top 125 GENEALOGY Websites are out ! Not surprisingly, all things Ancestry.com or owned by them are in the top 20. The 1940 US Census that came out on April 2nd, had a profound impact on the rankings. Obviously any web site related to the 1940 US Census had a boost in their ranking (except Ancestry which was already number 1). Here are the Top 125 Genealogy Websites (or click the image) ! SteveMorse.org, the One-Step Website that is a king of Swiss knife of genealogy actually dropped about 100K in the ranking and rising nine places on the list to become the 19th highest rated website ! This impressive improvement is related to the 1940 US Census, even though this is not one of the four websites with actual census pages. Dr. Morse’s http://www.stevemorse.org/census/unified web page which helps you find the best Enumeration District (ED) to browse (until indexes are created) by utilizing an address or the 1930 ED to point you at the valid 1940 ED(s) that you should begin your search with. Mocavo is the new genealogy search engine. You can think of this as a Google for genealogy web pages and databases. This is a fairly new launched service and was a big splash at this year’s RootsTech (2012). Mocavo too, was up nine places on the list and is now the 17th highest rated website. This relatively unknown website jumped an astounding 38 spots (now #47) on the top 125 and this jester thought that kind of improvement had to be mentioned. Louis Kessler‘s two websites: BeholdGenealogy.com (#87) and GenealogySoftReviews.com (#74) were new additions. I also added Archives.com to the list because it was one of the four websites hosting the 1940 US Census images. So Archives.com cracked the list at #6. Well done! You may also recognize this website as the newest acquisition by Ancestry.com. Stanczyk has had to give his own website a honorary spot, as my blog has dropped out of the top 125??? I am bit surprised, as last year when my popularity increased 4-fold I gained 5M in the ranking and had a nice #120 spot. In 2012, thanks to you my faithful readers, my popularity increased between 2.5-3-fold again. Surprisingly, I dropped 5M in my rankings and I had to remove my website from the top 125. Alexa.com are you sure? 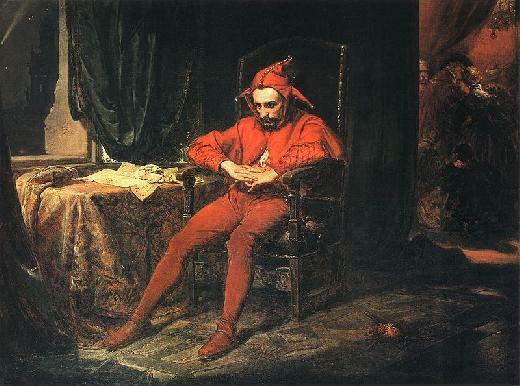 This jester is sorely puzzled as my website stats are off the charts this year and I have already matched last year’s unique reader count and it is only the end of April! Another indicator that my readership is up 3-fold. However, I yield to the methodology and look forward to making the list next quarter. Stanczyk, had a good day today. On a lark, I went down to see, with a new friend (Bob S.), the Slavic Roots Seminar at Nazareth Academy in Philadelphia, PA. I thoroughly enjoyed the short one-day seminar put on by Lisa Alzo (The Accidental Genealogist), Matthew Bielawa (HalGal.com), and Jonathan Shea (this jester owns no less than four of his books — from which I learned to read Polish/Russian from his two volume series In Their Words: A Genealogist’s Translation Guide). I know both Matthew and Jonathan are PGSCT&NE members (as is this jester) and I thought the comfort level/comraderie between the three of these presenters meant that Lisa too was also a member/officer of PGSCT&NE. This free seminar was extremely well attended (dozens of people). When you reach that level of critical mass you can find another genealogist who researches in an area near to your own family. Sure enough, someone near Bob & I was speaking about their Lithuanian heritage (Bob’s family line). The three presenters were very knowledgeable and also very personable — often the audience were amused at one of the presenter’s jests. This jester was also happy to finally hook up with Donna Pointkouski, the very talented blogger, of the rather literate genealogy blog, “What’s Past is Prologue“. While she was not a presenter today (pity), she too was a part of the seminar set-up / organization. My thanks to all four of these expert genealogists, writers, and presenters — you made today a better day ! A Map of Toledo, Ohio. The dark rectangles (with the year numbers) are the Catholic Churches of Toledo. The Polish settlements are noted with the German given name for the region: kuhschwanz (cow’s tail). ELIASZ – MYLEK – SOBIESZCANSKI (SOBB) were St. Anthony parish members. Saints (SS.) Peter & Paul was an an even older Polish parish ! Recently, Stanczyk was asked about a Pennsylvania family and if I could find their ancestral villages, so they could make a family pilgrimage to get in touch with their Genealogical Roots. See the red annotation (circle / underline) near the map center. 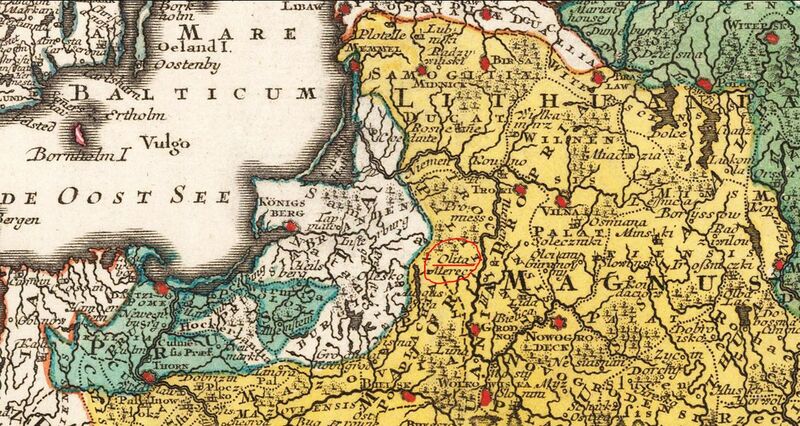 This is region as shown from a 1757 map of the Polish / Lithuanian Commonwealth. One of the immediate points of this region needs to be made explicit. Obviously, it was a part of the Lithuanian Duchy before, then Part of Poland, it became part of Prussian-Poland partition, then part of the Russian Empire, before becoming Lithuania in modern times. That much border re-drawing causes a lot of languages / archives to come into play. 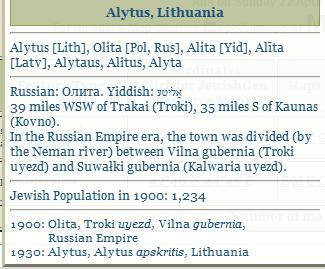 Records can be expected to be found in Latin, Lithuanian, Polish, German, Hebrew/Yiddish and Russian. Most researchers will want to take note of it as Olita in Suwalki wojewodztwo (when in the Polish Kingdom) or as Oлита (Russian/Cyrillic) in Troki uyezd, Vilna gubernia. Pradziad has some archival records too. Their records are for Jewish metrical records in the year range: 1835-1872 . Obviously, if you visit the locale, then parish records may exist in Udrija or Baksiai parishes/synagogues in the Alytus region of Lithuania. Besides the Catholic records, there may also be Lutheran records too. A more modern map (Olita/Alytus) can be found on the Polish map site mapywig.org . Please NOTE this is a large / detailed map. 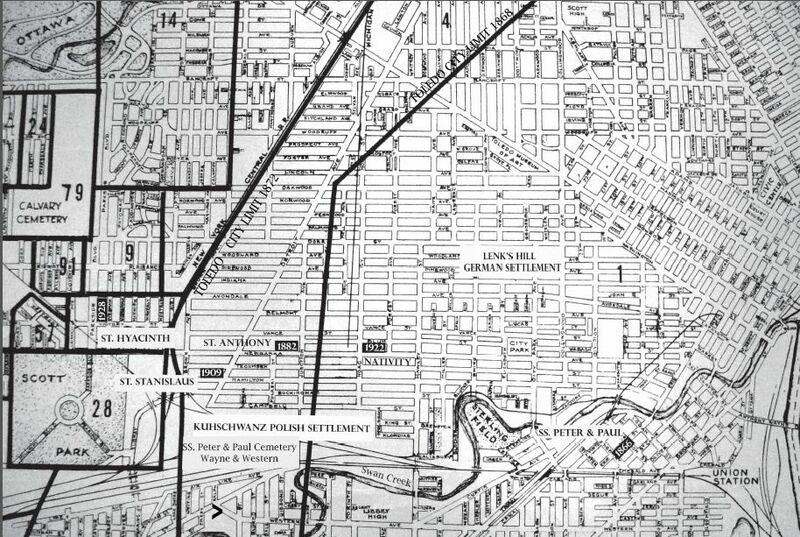 The area of this article is in the left-center area on the river. So I found: Eliasz, Gawlik, Gronek, Hajek, Kedzierski, Leszczynski, Mylek, Nadolny, Sobieszczanski, Solomon and Vespek. The Locales involved so far are: Detroit, Toledo, Buffalo/Depew, Philadelphia, and Cleveland. I have a folder on my computer titled, Source Documents. Within that folder, I have many sub folders for a wide variety of genealogical sources (Birth, Marriage, Death, etc.) and also a Census sub folder too. Some of those folders also have sub folders to organize like kinds of documents. This naming standard is really meta-data about the picture of the document. I use ‘jpg’ despite its flaws because it can be posted to the Internet. The file name is also a kind of source documentation. I can easily go back to the source from the file name and get a new copy. Also if you are a related genealogist, the above list can aid you to go get your own copy (from Ancestry, MyHeritage, Archives.com, or FamilySearch). What are you doing? How are you doing? Any great surprises? Researching the Same People? Do tell — email me. Remember I had some questions that needed answering? So how did I actually do? Will I find Rose Wlecial Gawlik’s brothers living with her? Answer: Boleslaw Wlecialowski was living with Adam & Rosa Gawlikowski family. I wonder why he was listed as a lodger (not brother/brother-in-law)? Rosa was the provider of the answers; Ergo, I would have expected her to say my brother Boleslaw. No Leon though. Is he in a VA Hospital (from WWI injuries). Why have I had such a hard time locating her borthers (Boleslaw & Leon) in city directories? Is Anthony Gawlick alive or dead? Answer: Dead. No uncertainty now. He was alive in 1939 City Directory and now is found deceased in April 1940. Ergo, he must have died between mid-1939 and April 1940. At least the range os possibilities are small. Is my grandmother’s older half-brother Frank Leszczynski still alive in 1940 ? No Answer. He was not located, but I now need indexes to determine if he died since 1931 Declaration of Intent. Is Frank Leszczynski living with Michael Leszczynski in Buffalo/Depew at 257 Broadway in the 1940 Census? William Gawlik was in the US Navy in 1935. This lead to finding his BIRL data and learning his range of enlistment. Mary Lou Sarotte was five doors down from Adam & Rosa. I guess this was how Uncle Joe Eliasz met aunt Mary Lou. Alice Eliasz “Epperly” – not found at any previous address. Catherine Eliasz did she marry and is that why she flew the nest? Is she married to Steve Perinoff and will her last name be Perinoff? Emil Leszczynski is the reason he is not at the family home because he is away at college (Fordham, I assume)? I still need to find a few Sobieszczanskis too — again the indexes will be required to find them. Where are my wife’s parents? That is how Stanczyk has done so far. How are you doing? Puzzled over my grandmother’s continued experimentation with “V” names in the US Censuses. Verna, Violet, … what was wrong with Valeria/Walerya? This Passover / Easter weekend seems a good time as any to reflect on our family genealogy. I know (or at least I think) that the website RAOGK/Random-Acts-Of-Genealogical-Kindness went defunct and that heirs/friends of the original website owner were trying to revive this website of genealogical service to others. I hope it does get a new life. But even if it does not, we can still engage in RAOGK. Genealogy is the original collaborative / crowd sourced research field. For years, I have volunteered and also been the benefactor of other volunteers who have bestowed their time/efforts for a greater good. It is one of the reasons, I treasure genealogy as a past time, because of the general kindness of our fellow researchers who also share a passion for research, history, genealogy and family and a fondness for others who also engage in genealogy. As my previous blog article chronicled, Steve Kalemkiewicz did his part this Holy Week. He went to the Detroit Public Library and did just a bit more research than just what he needed to do for himself. As a result we all have 14 new names that may benefit our research. On Good Friday, I was able to get back to Holy Trinity Cemetery (Phoenixville) and take about 70 pictures of headstones. This I sent off to the PGSCT&NE for their cemetery databases. It should yield a good 100-140 new names for their databases. Holy Trinity is a mostly Polish cemetery, in fact its name on the two Gate Posts is written in Polish on one and English on the other. I thank Jonathan Shea and the others at PGSCT&NE who collect and post this info to their website. As a side note, I’d like to mention that the PGSCT&NE is putting on a free seminar for researching your Slavic Roots. You can register for this April 28th seminar, by calling 215-360-3422. The seats are limited and You Need to pre-register. This is another RAOGK. Do yourself and others some good and perform a RAOGK soon! Happy & Blessed Easter/Passover to all readers! Found his grand-uncle Michael Leszczynski (deputy sheriff) at 5071 Broadyway, Depew, Erie County, NY in the 1940 US Census. He was in ED 15-37, on SHT 6-A (line 4 was Michael and his wife Felicia was on line 5). Click on the link if you have access to Ancestry.com. Kudos to Ancestry.com for getting their 1940 US Census working in short order. Their Image Viewer is excellent, very fast. Ancestry.com – 1940 US Census is Awesome … except can we have all 50 states, PLEASE? LOVES Ancestry.com version of the 1940 Census. The Image Viewer is fast, sleek, easy to use — aahh flawless. DE, RI, NV, IN (or Panama Canal, American Samoa or Virgin Islands). Oh, and please call http://1940census.archives.gov and tell them how deploy Scalable, Well Architected, Web Apps, please. Here is Stanczyk’s initial research list before there are complete indexes.